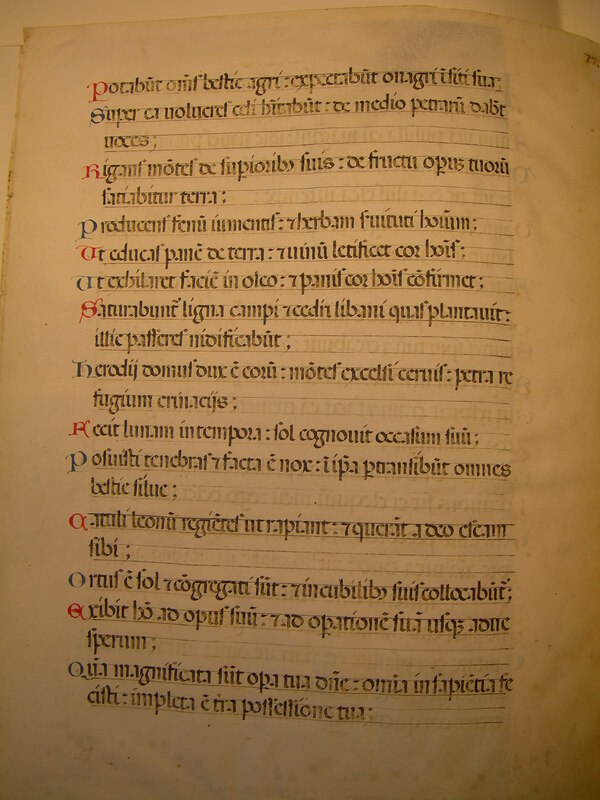 Text: Psalms 103:11-24 (recto); Psalms 103:25-104:4 (verso). Potábunt omnes béstiæ agri; expectábunt ónagri in siti sua. Super ea vólucres cæli habitábunt; de médio petrárum dabunt voces. Ut exhílaret fáciem in óleo, et panis cor hóminis confírmet. Heródii domus dux est eórum. Montes excélsi cervis; petra refúgium herináciis. Fecit lunam in témpora; sol cognóvit occásum suum. Cátuli leónum rugiéntes ut rápiant, et quærant a Deo escam sibi. Ortus est sol, et congregáti sunt, et in cubílibus suis collocabúntur. Exíbit homo ad opus suum, et ad operatiónem suam usque ad vésperum. Quam magnificáta sunt ópera tua, Dómine! Omnia in sapiéntia fecísti; impléta est terra possessióne tua. 11 All the beasts of the field shall drink: the wild asses shall expect in their thirst. 12 Over them the birds of the air shall dwell: from the midst of the rocks they shall give forth their voices. 13 Thou waterest the hills from thy upper rooms: the earth shall be filled with the fruit of thy works: 14 Bringing forth grass for cattle, and herb for the service of men. That thou mayst bring bread out of the earth: 15 and that wine may cheer the heart of man. That he may make the face cheerful with oil: and that bread may strengthen man's heart. 16 The trees of the field shall be filled, and the cedars of Libanus which he hath planted: 17 there the sparrows shall make their nests. The highest of them is the house of the heron. 18 The high hills are a refuge for the harts, the rock for the irchins. 19 He hath made the moon for seasons: the sun knoweth his going down. 20 Thou hast appointed darkness, and it is night: in it shall all the beasts of the woods go about: 21 The young lions roaring after their prey, and seeking their meat from God. 22 The sun ariseth, and they are gathered together: and they shall lie down in their dens. 23 Man shall go forth to his work, and to his labour until the evening. 24 How great are thy works, O Lord? thou hast made all things in wisdom: the earth is filled with thy riches. Draco iste quem formásti ad illudéndum ei. Ómnia a te expéctant ut des illis escam in témpore. 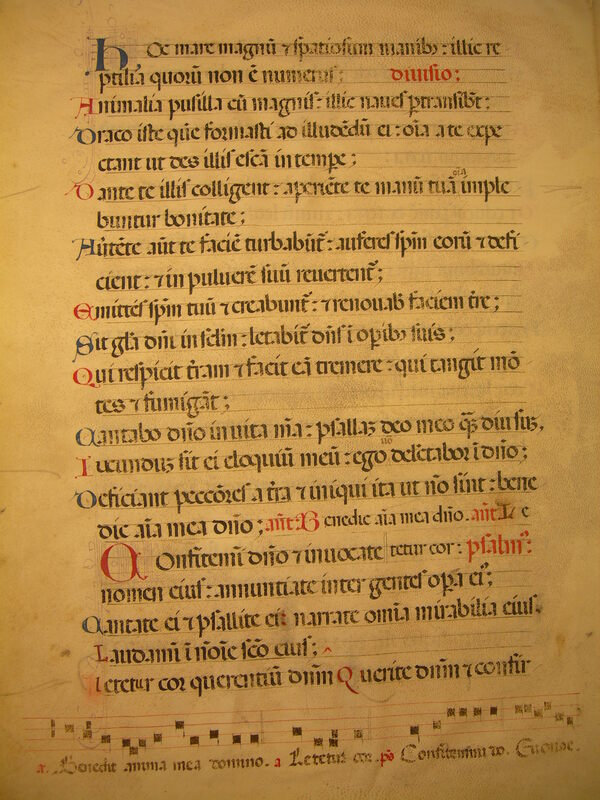 Dante te illis, cólligent; aperiénte te manum tuam, ómnia implebúntur bonitáte. Averténte autem te fáciem, turbabúntur; áuferes spíritum eórum, et defícient, et in púlverem suum reverténtur. Emíttes spíritum tuum, et creabúntur, et renovábis fáciem terræ. Sit glória Dómini in saeculum; lætábitur Dóminus in opéribus suis. Qui réspicit terram, et facit eam trémere; qui tangit montes, et fúmigant. Cantábo Dómino in vita mea; psallam Deo meo quámdiu sum. Jucúndum sit ei elóquium meum; ego vero delectábor in Dómino. Defíciant peccatóres a terra, et iníqui, ita ut non sint. Ant. Bénedic, ánima mea, Dómino. Ant. [ ] Psalmus. Confitémini Dómino, et invocáte nomen ejus; annuntiáte inter gentes ópera ejus. Cantáte ei, et psállite ei; narráte ómnia mirabília ejus. 25 So is this great sea, which stretcheth wide its arms: there are creeping things without number: Creatures little and great. 26 There the ships shall go. This sea dragon which thou hast formed to play therein. 27 All expect of thee that thou give them food in season. 28 What thou givest to them they shall gather up: when thou openest thy hand, they shall all be filled with good. 29 But if thou turnest away thy face, they shall be troubled: thou shalt take away their breath, and they shall fail, and shall return to their dust. 30 Thou shalt send forth thy spirit, and they shall be created: and thou shalt renew the face of the earth. 31 May the glory of the Lord endure for ever: the Lord shall rejoice in his works. 32 He looketh upon the earth, and maketh it tremble: he toucheth the mountains, and they smoke. 33 I will sing to the Lord as long as I live: I will sing praise to my God while I have my being. 34 Let my speech be acceptable to him: but I will take delight in the Lord. 35 Let sinners be consumed out of the earth, and the unjust, so that they be no more: O my soul, bless thou the Lord. Ant. [ ] Psalm.